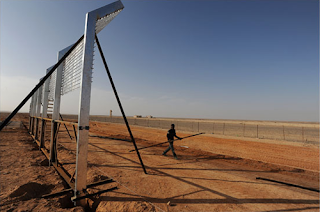 The government is employing Eritrean asylum seekers to help build a border fence designed to keep out other migrants seeking to enter the country from Africa via the Sinai Peninsula. A man who gave his name as August, one of four Eritreans working for a contractor along the fence route, said he had sought work for a long time before he was told a construction job was available near Eilat. He had arrived in Israel five months ago. According to August, the hardest part of the journey was trekking through the African desert. Now, once the border fence along the Egyptian frontier is completed, migrants will find it even more difficult to enter the country. August laughed when asked if he felt guilty that he was helping put up a structure designed to keep fellow Eritreans out of the country. "I have a family that remained in Eritrea," he said. "While they would love to come here, they know the journey isn't easy." As August tells it, he simply has no choice but to earn a living any way he can. 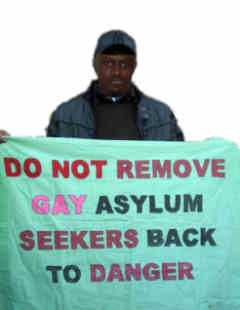 While the state has legally barred its citizens from employing asylum seekers from Africa, it doesn't enforce the ban. Months ago, the Interior Ministry's Population Registry inserted a clause in the temporary-status visas given to asylum seekers stating that under no circumstances could they be hired. But it is in the state's interests for asylum seekers to support themselves financially, so it has turned a blind eye to asylum seekers who break the law - until it can finish building a large holding facility that will provide the migrants with their basic needs. Only then will the state start enforcing the no-hiring law. The Interior Ministry is also looking to clamp down on asylum seekers' employment by local councils and municipalities. Two weeks ago, the head of the Population Registry reiterated to the local councils that the hiring of migrants and asylum seekers was forbidden. "Dozens of contractors are working to build the border fence along the Israel-Egypt border," the Defense Ministry said in a statement. "It was made clear to these contractors that they could not hire illegal workers to finish the project. We are not aware of any instance in which workers are hired to contractors to help build the border fence in contravention of the law." A contractor who is caught employing an illegal migrant would be subject to disciplinary measures, the ministry said.